It’s 10 years since we were in this neck of the woods and, Gordon reported, some redevelopment has been done to the Ferry Building on the bay at the very end of Market Street. We jumped on a local bus and set off down Geary Street to play tourist and investigate. The bus dropped us at Market and First and we sauntered down to the Ferry building to find the Ferry Building transformed into a bustling Farmer’s Market. Some very enticing smells assaulted our olfactory organs and we traced this to a smoking charcoal grill making ready for the lunchtime rush of office workers seeking lunch. Let’s face it, a buffalo burger would have been my first choice but I rejected the obvious in favour of a roast eggplant and cannelini bean tamale from the neighbouring market stall. Having solved the initial puzzle of how to eat it (it is mainly fragile cornmeal wrapped in a corn husk), it was quite pleasant but I couldn’t help but wish I’d gone with my initial carnivorous preference involving barbecued buffalo. 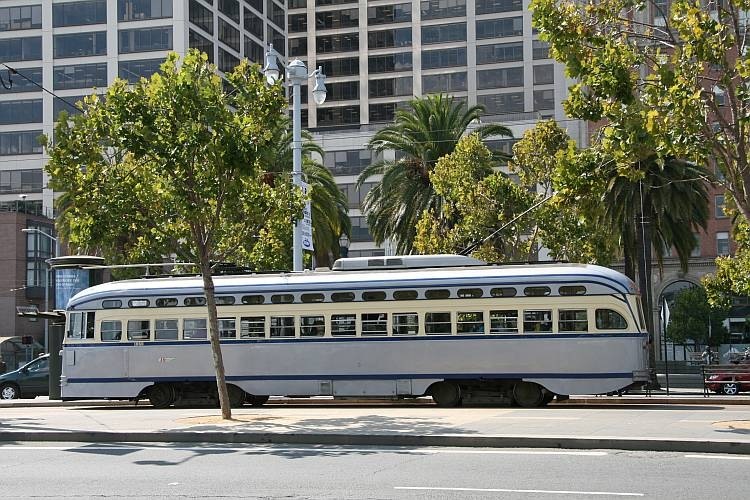 There is now a wonderful collection of old trams running back and forth along the Embarcadero. The trams have been collected from various parts of the world, including Milan, Italy and make for some very colourful public transport. I’d have liked to stay taking a full set of photographs of all the individual trams as they plied their trade but tourism called so I contented myself with a few snaps and hit the tourist trail. In this case, our tourist trail was along the Embarcadero from the Ferry Building, passing all the odd numbered piers towards the well-known Fisherman’s Wharf. (Odd numbered piers run west west from the end of Market Street, even numbered piers run east.) Immediately, shades of Harry Potter strike as one passes pier 1½. San Francisco was said to have some 3500 restaurants, a relatively large percentage of which cease trading every year. Although it’s been 10 years since my previous visit, I noticed a few, including The Waterfront (a very good fish restaurant) and McCormick and Kuleto’s that had survived and still existed. Our first stop was the very touristy Pier 39. This pier seems half tourist-trap shopping arcade and half fairground, sporting a carousel and street entertainers. 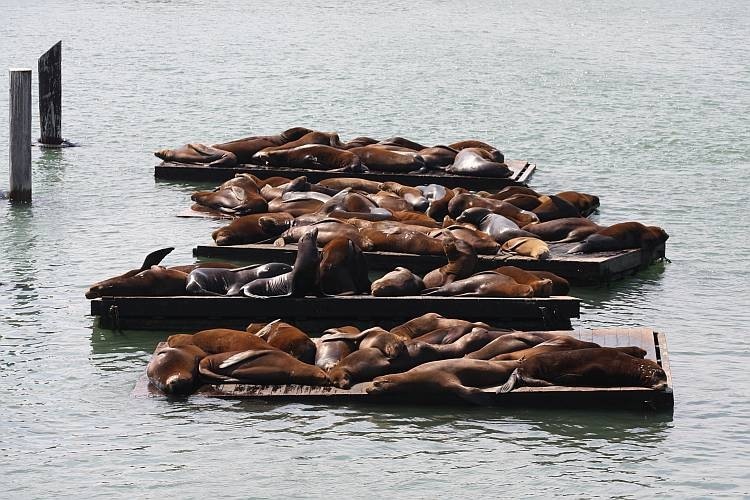 It’s a good place to see a large collection of Californian sea-lions sunning themselves on wooden pontoons, though. Next on the circuit was good ol’ Fisherman’s Wharf where, the emphasis is very much on the local Dungeness crabs. In all my 40 or so visits to San Francisco, I have never once had any crab from Fisherman’s Wharf. Being a seafood fanatic, I really cannot explain why. Today, I set about correcting both that long-standing oversight, and supplementing my otherwise meager lunch of a single vegetarian tamale, by treating us to a crab sandwich. After a quick and very restrained look around Ghirardelli Square, shopping central for the chocaholics, we struck out further west along the Marina toward the Golden Gate bridge. Time was marching on, though, and one of our hips was feeling the effects of other marching so we found a phone and summoned help from our very kind hosts. Kim was soon to be leaving work so she diverted from her usual run home and rescued us.